« April 2019 Wine Special! 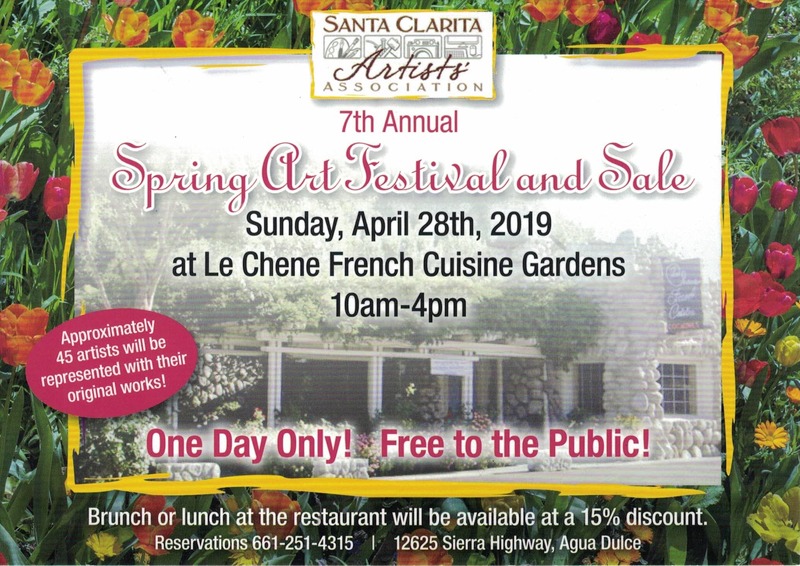 On Sunday, April 28th, 2019, you’re cordially invited to come and enjoy a wonderful afternoon of Food, Wine and Art in the beautiful garden at Le Chene French Cuisine Restaurant in Santa Clarita! The 2019 Santa Clarita Spring Art Festival is the 7th Annual Event of its kind and will feature the original works of approximately 45 artists! The event is free and open to the public, and during your visit, you’ll be able to enjoy a 15% discount on either Brunch or Lunch in the restaurant when you mention “SCV Arts Festival”. Brunch will be served from 10 AM – 3 PM but the Arts Festival will continue until 4 PM. We look forward to seeing you and appreciate your support of these wonderful artists!